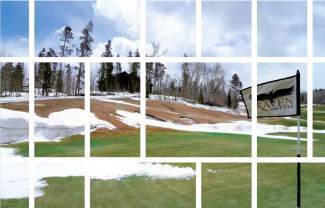 Beginning in March, while most of us were still chasing powder days, employees of High Country golf courses were shifting their attention from wintertime responsibilities to making preparations for the upcoming season. As spring slowly reared its head and temperatures began to rise, so too did a friendly debate among course superintendents over the best time to clear greens and tee boxes of the still lingering snow. Surprisingly, the same snow that provides High Country residents with epic powder days also brings with it a unique set of benefits, as well as some challenges, for local course managers, said Caleb Kehrwald, general manager of Raven Golf Club at Three Peaks in Silverthorne. On the plus side, snow is a pretty good insulator, Kehrwald said, and when there’s a thick blanket of it, the grass doesn’t shift into dormancy, it can stay green all winter and it may even grow an inch or two. Snow’s insulating qualities also keep ground freeze to a minimum, which reduces the number of potential problems with irrigation. However, the combination of snow and sunshine can create a sort of ozone effect on the surface of the turf, said Tom Buzbee, director of golf at Gypsum Creek Golf Club, which creates ideal conditions for snow mold that can have a detrimental effect on course conditions. There are products on the market, called fungicides, that aid in preventing snow mold growth. They come in spray and granular forms and must be applied in the fall before the snow starts flying. In that sense, preparations for the start of the new golf season really begin at the conclusion of the previous one. But because fungicide also is expensive, superintendents generally only use it on the most vital sections of the golf course, namely the greens and tee boxes. Last year Buzbee made the decision to apply both spray and granular fungicides to his tee boxes and greens. In hindsight, he lucked out in doing so because modern fungicides come with an expiration date and will only effectively prevent snow mold for a specific number of days. Although the debate about snow clearing predominantly revolves around fungicide efficacy, David Dean, superintendent at the Raven, said weather also plays a big role in determining when course employees remove snow from tee boxes and greens. Although clearing snow while fungicides are still actively preventing snow mold growth is a priority, a sudden return of winter could shock exposed grass into dormancy, resulting in brown greens and tee boxes at the start of the season. A perfect example came last year when Summit County received 25 percent of its total 2013 snow accumulation in the month of April. With so many variables to consider, one might think a dry winter would benefit local golf courses. Although less snow often means an earlier start to the season, the lost insulation causes a whole host of other issues. Without snow, the ground tends to freeze at deeper levels, causing expensive damage to a course’s irrigation system. Deeper ground freezes also cause grasses to transition into a state of dormancy, and although the surface is exposed to springtime elements, it takes significantly longer for soil temperatures to warm to the point that the grass reactivates itself. “Regardless of what the winter brings, you’re always going to face challenges when trying to prepare the course for the season,” Kehrwald said. “I’d take snow every time because it protects the grass and allows it to recover more quickly. Where do High Country golf courses get their water? Unlike Colorado’s Front Range, the High Country is blessed in the sense that every course receives the majority of its water from mountain runoff. Although superintendents face certain challenges during years when Colorado is in a state of drought, like in 2001, agreements between golf courses and their municipality or senior water rights have always ensured High Country golf courses have enough water to keep their fairways green, without over doing it. Mark Nickel, director of golf at Raven Golf Club at Three Peaks, said the course in Silverthorne receives 100 percent of its water from mountain runoff. The course has numerous storage ponds and lakes throughout its 18-hole layout, with six designated as water retention areas, but only uses one to actively irrigate the course — the big lake on Hole 11. The storage capacity of the lake on Hole 11 wasn’t clear by press time, but course general manager Caleb Kehrwald said it’s about 12 feet deep and has enough water to sustain the course for about three days. But even during times of drought, Kehrwald said they’ve never reached the point where the Hole 11 lake was in danger of running dry. “We’re fortunate to be on this property and to have the water rights that we have,” Kehrwald said. “We take a good amount of water out of the lake when we need to, but it’s constantly being fed by runoff. As long as there’s snow on the peaks and water running off, we’re going to be good.” When times are flush, Kehrwald said they’ve gone weeks without having to pull water out of storage. Unlike the Raven, Byers said his 27-hole layout demands two active ponds for irrigation, the biggest being between holes 1 and 9 on the Elk Nine, and the second located near the tees for Hole 2, also on the Elk Course. Byers estimated the two ponds hold about 20 to 30-acre feet of water. An acre-foot is equal to 324,000 gallons of water. Although he doesn’t even want to think about the hypothetical situation of not receiving any surface water to replenish his ponds, Byers said Breck Golf Club has enough water to keep the course looking green for about a third of the summer. In addition to receiving water from the creek on Gold Run Road, Byers said Breck Golf Club also can pump a limited amount of water from the Swan River if needed. The town of Breckenridge has senior water rights and there are restrictions in place about how much water the Breck Golf Club can use, but Byers said they’ve never come close to reaching their limit. Even though it appears the Breck Golf Club has few worries about keeping its fairways lush, Byers said the club is installing a new irrigation system on the original 18 holes — the Beaver and Bear nines — that will be more efficient and significantly reduce the amount of water used on the course.